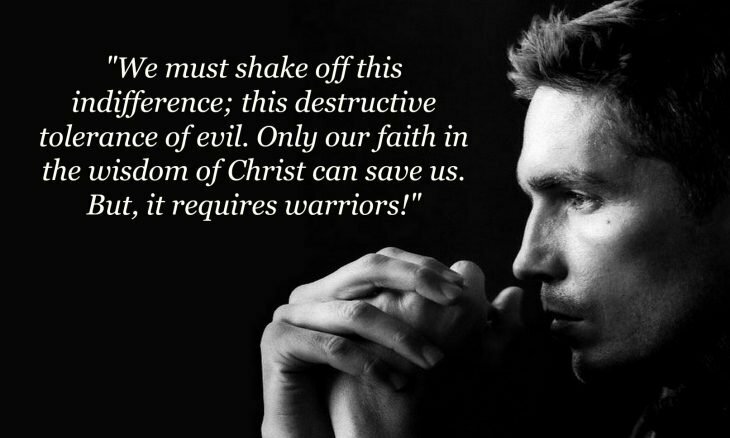 Home › Sermon Archive › Jim Caviezel Stuns College Students: "We Need Warriors!" FOCUS, the Catholic ministry for college students, recently had their conference near Chicago. A surprise speaker, actor Jim Caviezel, who played Jesus in Mel Gibson’s 2004 film The Passion of the Christ, entered the stage to a standing ovation. Set yourself apart from this corrupt generation. Be saints. You weren’t made to fit in, you were born to stand out. For in our country now, we are only too happy to go with the flow. We have a shrine to freedom now, where all choices are equal, no matter what the consequence are. Do you honestly think this is true freedom? Can society exclude moral truth and moral reasoning? Every generation of Americans needs to know that freedom exists not to do what you like, but having the right to do what you ought. … Freedom from sin, freedom from your weaknesses, freedom from this slavery that sin makes out of all of us. That is the freedom that is worth dying for. You Raise Me Up When I am down and, oh my soul, so weary When troubles come and my heart burdened be Then, I am still and wait here in The post You Raise Me Up appeared first on Roman Catholic Man. St. Maximilian Kolbe Prayer of Consecration O Immaculata, Queen of heaven and earth, refuge of sinners and our most loving Mother, God has willed to entrust the entire order of The post Today is Consecration Day. Our Lady of Lourdes, Pray for Us! appeared first on Roman Catholic Man. By God’s Divine Providence, we had scheduled our Marian Consecration Day on April 16, the day after our 54 Day Rosary Novena, which is the Feast Day of St. Bernadette The post USGF: Tomorrow We Make Our Marian Consecration on the Feast of St. Bernadette of Lourdes appeared first on Roman Catholic Man. DAY 54 – OUR LADY OF VICTORY, PRAY FOR US NO CROSS, NO CROWN! No cross, no crown. No pain, no gain. No guts, no glory. St. James summons us The post Day 54, USGF Operation ‘Reparation 54’ – No Cross, No Crown! appeared first on Roman Catholic Man.